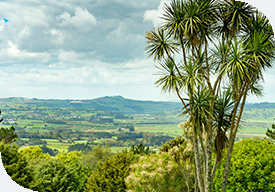 Traditionally famous for onions, Pukekohe’s proximity to Auckland makes it an eye-wateringly desirable locality for a country lifestyle. Mark Needham of PGG Wrightson Real Estate specialises in marketing farms and lifestyle property in and around Pukekohe. He says the town has many features that are more and more appealing to anyone seeking to live the rural dream. “Auckland is coming towards Pukekohe. Most of the major retail outlets have located themselves in the town, and numerous subdivisions have arisen in recent years. This is the motor racing capital of New Zealand, with the V8s from Australia making their presence felt once a year, and we have an active equine fraternity, with polo, racing and trotting all strong in the area,” he says. Young professionals have been particularly attracted to the area recently, says Mark. “People can base themselves here, with an office at home, and organise the time they need to spend in meetings in Auckland to avoid the traffic that is now part of a conventional commute. Pukekohe is connected to Auckland’s rail system, so that is a good option for many. What the town and district offer are more expansive properties than you would be able to find in the city, at prices well short of what you would typically pay for somewhere much smaller in the city,” he says. Schooling also offers a dimension that is not possible in a city-based education. “Our local schools all retain a country flavour, with the likes of calf clubs and the general emphasis on the outdoors that is not part of the way of life for children growing up in urban environments,” says Mark. Pukekohe’s heritage and traditional image inadvertently work in favour of lifestyle properties. “With changes to the way market gardens are worked, and urban expansion, there is pressure on some local farming land, which can offer owners a better return developed into housing. When local families originally developed market gardens, back 100 to 150 years ago, they were generally set up in small parcels of land, on two to four hectare blocks, which was enough to make a living then. However, since that time, farming practices and the economics of production have changed radically, and to grow crops on that size land is no longer practical. Because much of it is fragmented, those blocks are no longer commercially feasible for market gardening, although they are an ideal scale for lifestyle blocks,” he says. Mark Needham is one of five PGG Wrightson Real Estate salespeople based in Pukekohe.